Download a free guide to diving America's Marine Sanctuaries (courtesy NOAA). The best time to dive Hawaii is between April and October. September and October have the warmest water and it is quieter then. "Night time Manta dive gives you a look at an absolute ballet of a menagerie of fish along with some of the largest mantas ever seen. " "At Kona only 2 mantas showed but they were incredible." 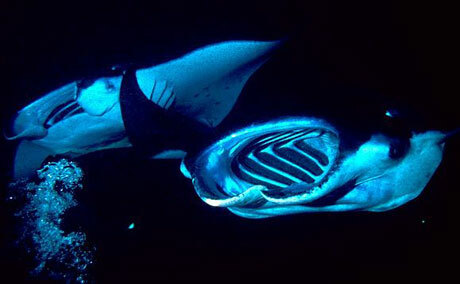 "Almost guaranteed, close-up viewing of Coastal Manta Rays on a night dive." "Truly and awesome and jaw-dropping experience to be surrounded by this ballet of one-ton giants twirling around you gracefully." "Exiting experience with dancing mantas. " "This was my first night dive ever and I couldn't have gotten luckier. We dropped to about 12 m and joined a circle of about 20 divers with our torches pointing upward. The lights formed a circle of beams and a huge school of silver baitfish were swimming and shimmering within the lights. Then the mantas flew in to feed on the plankton gathering in the light beams. These magnificent creatures feasted and danced for us putting on a show that was nothing short of magical. I was fortunate there was a videographer who got the whole thing on tape. I can't imagine any night dive surpassing Kona's Manta Dive. Some lifelong divers said it was their best dive experience ever." Underwater lights placed on the ocean floor attract infinite amounts of plankton, which in turn attract the huge, yet beautiful manta rays of Kona Hawaii. The rays get so close to you, that you often have to move to avoid them accidentally hitting you. This was by far, the best dive I have ever done. I have been to Sting Ray City in Grand Cayman before, and as good as that dive is, it came nowhere near the experience with the manta dive. It is very rare to experience such an amazingly wonderful and unforgettable time with one of the most beautiful and gentle animals in the world." "Seeing these amazing creatures swim right up to your face with their huge mouths open and simply glide right over you is one of the most amazing sights in the world. The grace of these large creatures is astounding. " "We had very good encounters with manta, we could count the spots on their body, they just want to be friends with the divers. " "Can't beat acrobatic manta rays swooping above your head!" "Shallow 35 ft manta ray night dives. All you do is be negatively buoyant and shine your light to the surface. The manta swoop and eat the plankton. No corals." "So much stuff! Eels! Mantas! Even a reef shark. " "This is really an unusual dive, 4-5 miles off W. Shore near Kailua Kona. You head out about 9:00PM and hook into a 40' weighted line. And THEN you watch an amazing migration as all kinds of juveniles and some amazing invertebrates make their way towards the surface to feed. Most sightings are pretty small, but almost all are transparent and pulsate with colors (orange, blue, green) around the edges. This dive isn't for everone, but it's truly one of a kind! I compared it to diving in a microscope with the strange sort of paramecium type "critters". It's a very unusual experience, I thought it was worth the cost. We stayed in the Kona area and also did multiple shore dives with Big Island Divers, a great group. It's in an uncomparable class of diving experiences. Make the dive guide PROMISE not to grab your leg when something cool passes by behind you...I thought I was lunch! " "swim throughs, seaturtles and frogfish. 65 feet "
"Tons of turtles all around. Dive through lava tubes. Snapper, eels, and trigger fish everywhere. " "Turtles and other large fish come through this area of cleaning." "The Manta Rays in the cool waters of Hawaii make this make it a great experience for all. Watching these creatures in the night is just wonderful." "60� dive amongst canyons of lava rock and coral, natural arch, and then the cathedral, which is a lava tube but has numerous holes that you could swim out of, white tip shark met us inside! Huge Javanese eel near the entrance!! GREAT DIVE!!" "Great for clarity, fish species, dolphin, turtle"
"Huge schools of jacks, and tons of sharks - this was an awesome dive." "A wall dive with a Hawaiian monk seal and the largest schools of butterflies I've ever seen. Lionfish everywhere." "1943 Navy oiler sunk for reef in 1989. Access holes cut in upright ship. " "The debris is very awesome and the most amazing thing is the No. 1 gun turret with the gun still intact. And there`s a from from the superstructure is lying beside the port bow." "Korean fishing boat sunk for reef in 1998. Lots of turtles and tropical fish everywhere. Amazing." "Magnificent wall dive with unlimited visibility open to the Pacific. Lots of Pelagics: 14 ft blue shark, reef, coral, colour." "The back side of this extinct cinder cone plunges to incredible depths and presents a wall dive with seemingly infinite exposure. It felt like a space walk as we hung on our safety stop in the clear blue with the sound of whales around us. We cruised the 100' level of the cone through forrests of black coral. Many unique critters here not found in other parts of the world. " "Awesome dive inside the crater, depth to 40 m, visibility to 45 m, pyramid butterflyfish, shrimps, eels, white-tip sharks "
"Best night shore night dive. Squid, parrot fish in bubble, slipper lobsters, spanish shawls...all sorts of critters! " "Hanama bay is incredible diving for the novice to the expeert and uncertified family can snorkel with ease and see almost as great wildlife as the divers. Beyond the near reef line there are resident turtles, transient rays, and every kind of sealife in this protected park. it isn't a technical dive. it does take some skill in rough water entries and exits during the winter. But everybody can enjoy it. After snorkeling Hanama with us my niece got certified. " "WWII corsair plane wreck. Sit in the cockpit 105 feet underwater. " "I am not an extremely experienced diver. I have 50+ dives though, all but two were in Hawaii. I can honestly say that one of the most beautiful dives I have been on is the First Cathedral dive on Lahaina...it is a 40-65 ft dive. It is a large lava tube, which is about 100 feet long and almost two stories high. As you enter the chamber for the first time you have to make sure to appreciate the full experience of the "Cathedral". When the sun's light enters through the holes in the ceiling they illuminate the chamber and the rock slab in the middle to create a absolutely stunning stained glass effect. There are several rooms and passages, including the "shotgun" which is a hole were you wait on the tide and then push through blasting back out of the cave and along the reef. Make sure you have ample time to explore for lots of crabs, lobsters, shell life and even an occasional white tip reef shark. The cavern in and of itself is a beautiful dive and thats what brings you in, but the surrounding reef is what makes you not want to resurface! . " "Up close encounters with scalloped hammerheads and gin clear viz!" "There are many dive shops on Oahu and all of the other islands. I am currently taking my Dive Master with Arron's dive shop Kaluia, HI. They are a good dive shop but a little on the high side. Most shops in Hawaii charge around $110-$130 for 2 dive off a boat. I did find a shop that has way cheaper prices. Its called Island Divers they charge around $65 for 2 dive off a boat. They were also running a special on Sat for 3 dives off a boat for $75, and they took us out to many great places a wreck dive and 2 drift dives. As far as accommodations you can stay pretty much anywhere in Waikiki and just about every dive shop will pick you up. I am not sure what your budget is but you can find hotels in Waikiki from $80 and up, but average is around $120. They also have hostels for around $25-45 depending on dorm or semi private room. If you're open to meet and connect with some local people that can tell you lots of info and probably show you many things, as well as free accommodations any place in the world I would suggest you check out a website called www.couchsurfing.org create a profile. I am a very active member and key member in Hawaii for this group." Offer black water night dives where you are attached to a 12 m vertical line in over 300 m of water at 10pm at night. You see life you've never seen before that rise to the surface to feed. Prices from $89 for 2 tank dives with all gear included (2007). "Fathom Five costs from $100 to $130, for a two tank boat dive. No more than 6 divers per boat, so nice personal attention. " "Dived the south shore of Kauai with Seasport Divers and they are a great operation. very knowledge staff, great dives, and so many sea turtles. Then I dove Niihau with them. the best dives I've ever had. 150 foot viz, monk seals, so many rare fish, wall dives and huge swim throughs. this guys are great. I recommend them to anyone. $110 for a 2 tank dive, $260 for 3 tank Niihau trip, $15 for 2 tanks of Nitrox. Definately worth the $$$, and they had the best price for nitrox I've ever paid. $15 for 2 tanks at 32%." "Giant Black Sea Bass, Garibaldi, kelp bass, lobsters... so much to see. Daily dive trips to over fifteen different sites in San Diego. 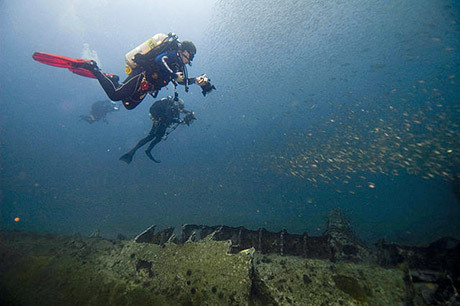 A NAUI dive centre offering Kelp forest and Wreck diving. "I've dived and snorkled all over the world and La Jolla is a unique and beautiful place. SeaStar is a great dive guide company: professional, personable, detail oriented and dedicated to safety. Our guide was exceptionally familiar with the area and went the extra mile to make sure we had the best possible experience. I would recommend them to anyone. They went out of their way for us. Service was excellent. Scuba diving and snorkeling tours of San Diego's best underwater sites. Scuba Adventure tours to Baja Mexico. Dive Instruction and boat dives also available. "Florida and the Florida keys have wonderful coral spots, they are amazing, specially key largo." "Ship sank as an artificial reef, sits in about 40 msw, not easy to access, therefore no fishermen. You will see goliath grouper, and an occasional sea turtle or shark. Good coral growth on the ship, and good swim through in the cargo hold." "Part of the Florida Keys reef system, this is the most diverse gathering of soft and hard corals I've ever seen. Relatively shallow, it is a great dive for photography and beginners. You will see Caribbean reef sharks, nurse sharks, snapper, barricuda, and many lobster. Normal visibility is usually in the 30 to 40 m range year around, and in the winter a 3mm suit with a hood is recommended, but in summer, a shortie is fine." "Number of reefs with abundant sea life." "Good wreck can be strong current, depth 60' to 105'." "Good wreck dive, good visibility, little current several swim throw's. Depth range65' to 110'"
"Part of the Florida Keys reef system, this is the most diverse gathering of soft and hard corals I've ever seen. Relatively shallow, it is a great dive for photography and beginners. You will see Caribbean reef sharks, nurse sharks, snapper, barricuda, and many lobster. Normal visibility is usually in the 30 to 40 m range year around, and in the winter a 3mm suit with a hood is recommended, but in summer, a shortie is fine.Nice reef dive with plenty of life, this is good for lobster season, or spearfishing if that is your bag. Lots of life, lots of coral, very relaxing and good for photography. Watch out for reef sharks and barracuda." "The christ of abyss in key largo florida is probally the best diving spot. the only problem is that is too crowded. the first time i ever went i went down and prayed. i was a little scared at first because their were 5 sharks around but i relealized that they were spooked eaisly. the reef is nice but the staute is beautiful. don't step on the reefs thogh you get fined a lot by the florida P.D. " "Great reef fish, lion fish"
"60 ft + vis, variety of life and coral"
"110 ft, 80 + ft vis, great temp, lot of wreck fish"
"Spring is a large volume producing spring adjacent to the Suwannee River ( a tannic coloured river do to cedar groves along the bank) Depth of spring 60 to 70 feet, clear water to rivers edge. There is the remains of an old civil war paddle wheeler burn to the waterline, by the crew and Captain, who went to fight for the Confederate forces. Animal life turtles, snakes catfish, mullet, bass and juvenile sole. The side walls of the spring are silts laden and conditions can go quickly from clear to murky, but the springs volume of water will clear up the spring within 20 Minutes. Best dove by divers with good buoyancy control. It is a good dive site if you have diving skills and those diving with you do as well…otherwise it will silt up. If you are a certified diver the cost of entry to the spring is $5.00. " SCUBA diving and rescue training institute. Diving in Key Largo at John Pennekamp State Park.
" This is one of the oldest commercial diver training centers in Florida. When they don't have students, they will take a minimum of 4 divers to any site you wish, or will recommend some good ones. Very professional, very safety oriented and interesting people. The first day we went out, it was stormy with heavy seas, but the operator was willing, and since we were all experienced divers they took us out. The boat was set for 20 divers, so very spacious with just 4 of us. The captain and dive master were first rate. Good value for money, since most 2 tank dive trips in the keys, cost about US $70 to $80, with tips extra, a 1/2 day 2 tank dive will cost about US $75. Good value for money, since most 2 tank dive trips in the keys cost about US $70 to $80, with tips extra. Most of the dive operations in the Middle Keys cooperate with one another, so if there is a certain spot you would like to dive and the shop you called isn't going there, they will call around and find another boat. On highway 200, one block West of highway 441. Come check out our adventurous dive expeditions for both the novice and the highly skilled. Our premier dive vessel is docked in Key Largo , Florida, the home of the third largest barrier reef in the world. The reefs here are spectacular and rival those of many Caribbean areas. Approximately 6,000 coral reefs are found between Key Biscayne and Dry Tortugas. Our trips offer personalized dive charters to fit your skill level whether you're a novice or among the highly skilled." "Will go out with as few as 2 paying divers, big plus. Highest safety standards, PADI 5 Star center. Stayed at the Marriott, Holiday Inn, Marina Del Mar - excellentvalue. They train in some of the best fresh water springs in Florida. I did my openwater final dive in Devil's Den... great site. If you want to get certified - this is a great way to do it. Visit Fla, where the weather is great, dive some springs... These guys are flexible, will arrange training for you. They will work with you on your training. They never "fail" a student - they will continue your instruction for no added charge until you pick up the skills you need. They are in Orlando - plenty of places to stay. The equipment they sell high quality equipment and their prices are some of the lowest anywhere..
Best dive shop I know of. "Dave Champagne @ Key Dives. Great people, reasonable cost. Safest group I've ever been with, great visibility, warm waters, coral, wrecks, amazing fish. The crew is fantastic (Jack, Morgan, Eric) boat crew all very good, 42 ft boat, well equipped. Instruction is first class. Excellent value, I did adv open water/enriched air. Best group I've been with and that includes Tahiti, Bora Bora, Maui and Australia. I can't wait to go back to Key Dives"
"While both on the deeper side (for beginners) 70-100', super accessible and open "
In the summer and fall of 1998, a little known freshwater creature has appeared in Dive Land Park's quarry, Craspedacusta sowerbii or Freshwater Jellyfish as they are more commonly referred to. It is not common to see occurrences of freshwater Jellyfish, so I must say I felt privileged to get an up-close view of this harmless nickel sized creature. C. sowerbii, other than their small size, seem to look and behave like their larger saltwater cousins and they cannot sting humans! Be sure to look for the Freshwater Jellyfish when you visit Dive Land's quarry. They were observed in shallower waters near the quarry's rim from 0 to 35 ft. in depth. For more complete and detailed information, and to report sightings, you must visit Dr. Terry Peard's research project on Craspedacusta sowerbi at the Indiana University of Pennsylvania. Dr. Perry is looking for sighting reports and details to continue building his research database. This dive site promises to be more than just the average quarry/Pit dive..... IE cold water nothing to see..... If nothing else it is a chance to see freshwater Jellyies.... "
"The dive is not for the "faint of heart" especially if you are wearing a wetsuit (as I was). The temp drops to 41 degrees below the thermocline, but the views of well preserved shipwrecks is worth the shivering. My favorite is the Eber Ward, century old wreck in 120 feet of water. This ship was sunk in 1909 after encountering packs of ice on its first journey of the season, leaving holes in the bow large enough to swim through. There are entrances at the stern as well, and once inside you can swim from one end to the other entirely inside on not one but TWO decks. The upper one is the more interesting, with rows of hand carts towards the bow, and well-preserved loading gear hanging under every cargo hatch. Two large, hinged anchors are still inside the bow, and another rest just below on the lake bottom. One of the strangest items to find was a capstan inside the wreck. The not-to-be-missed items on this wreck include the prop, bathtub, and ultra-rare mushroom anchor which is still in place in the hawse pipe on the port side. Of the 700 or so dives that I've done around the world since 1975, this was my favorite. "Beaver Island, Lake Michigan,cold fresh water dives. Lots of steamer 1900 ship wrecks in shallow water near the islands surrounding Beaver Island. Contact Mike Weede to take you to the destinations." "North Carolina has some of the best diving on the east coast, including some of the best wreck diving in the world. The gulf stream allows for great visability. A german submarine sunk in 1942. It was depth-charged by US coast guard boat Icarus and then scuttled by crew who abandoned ship at the surface. Seventeen crew were killed and the reset taken as prisoners of war. The U-352 lies at 30-35 m (100-115 ft). It is intact and you can swim round it a couple of times during a dive. "Nazi sub actually sunk in battle. The wreck is still in great conditions and easily accessible at recreational depths. Home to many sand tiger sharks. Dead Nazis and sharks...who could ask for more! Please send us your comments on diving in the USA. Do you want to recommend a diving centre or dive site? Let us know. Have a question - we're waiting to hear from you.